Please start a list of bad sellers like the list of bad buyers. All is fair right? Especially focus on those with excessive shipping who do not make use of the many cheap shipping options that are now available. Here's one that uses the 'you live in some area NOT in my backyard so you must PAY' method of delivery. For the edification of people in Gauteng, Port Elizabeth, East London, Stellenbosch, George etc are major metropolitan areas and not 'remote' locations. And here we have the "Everywhere but central JHB is far, far away" method of charging. Must be returned in 7 days in ORIGINAL condition. No refund on shipping charges and A.D. fee. 30 days warranty, buyer is responsible for return shipping costs .No claim for physical / water damage or Wear and Tear. So after paying for shipping (at R165!!! 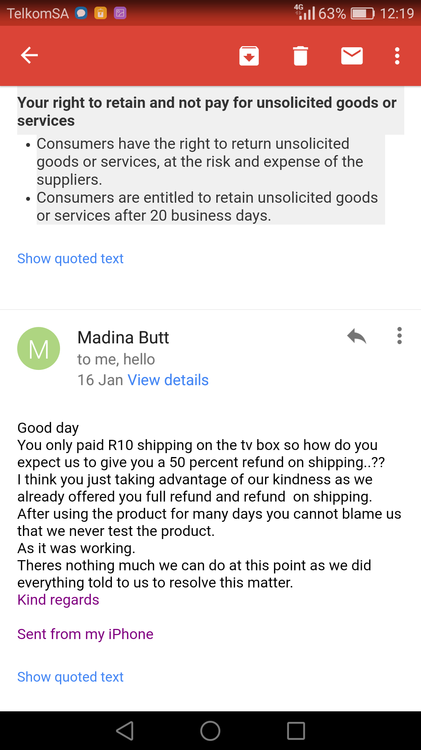 per item if you live outside of Gauteng) and to ship back to them again (because SAPO will not meet the within 7 days requirement) and whatever their 'admin fee' is, you'd be better off just sucking up the loss if the item isn't working. This is ignoring the R165 courier fee. I know the feeling , exactly the same situation , I am now gatvol of bidorbuy after selling and buying since 2007 , with over 12000 positive ratings. They are all unethical in this horrendous rip off , and they just cant see an issue????????????? I agree with you guys, living in a "remote" area the courier fees are often exorbitant & getting sellers to offer something like Paxi is greeted with horror. Where else do you sell Silverrhino? I came here to try and find out how to report "CHRISTMAS_STORE" for the exact reason. Nowhere in their T's&C's do they mention not being able to send one's own courier. Yet when I requested to do so, they insisted that I could not. I refuse to pay more than R120 for a courier from JHB to George. Especially for a single item worth R43. Which I won on an auction so it's not like we could have figured this out before the time. So the seller canceled the sale and gave me a bad rating. My first bad rating ever. I don't know how to return the favour. they should not be allowed to trade like this. It is daylight robbery. 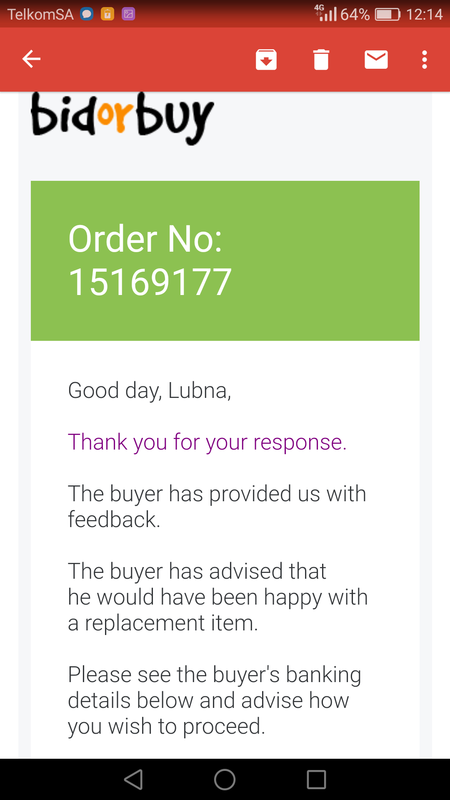 I had the same experience with a seller giving me a bad rating only because I struggled with the payment options needed to be used via bidorbuy. I did not feel comfortable at the time to give my card details since it was first time purchases. Also some products I bought has such poor quality - shocking! A waste of my money and therefore I am so sceptical to purchase future items. 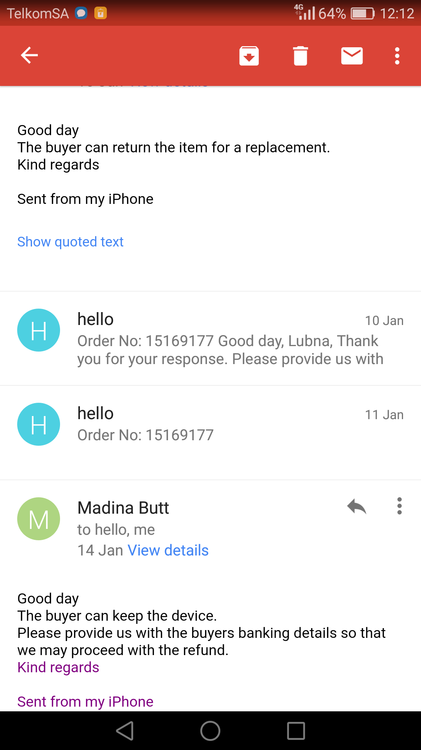 I bought this item listed below on 6 December. The item was delivered to my neighbour's house after I specifically left instructions with the seller to tell the courier to contact me before delivery...I was never infurmed or caljed about the delivery date...but I let that slide. Then the item that I purchased worked for + - a week...then went completely dead. I contacted the seller and he offered to re-sell me a replacement item if I agree to carry 50% of the cost and pay full delivery fee again. I then contacted BOB to intervene. 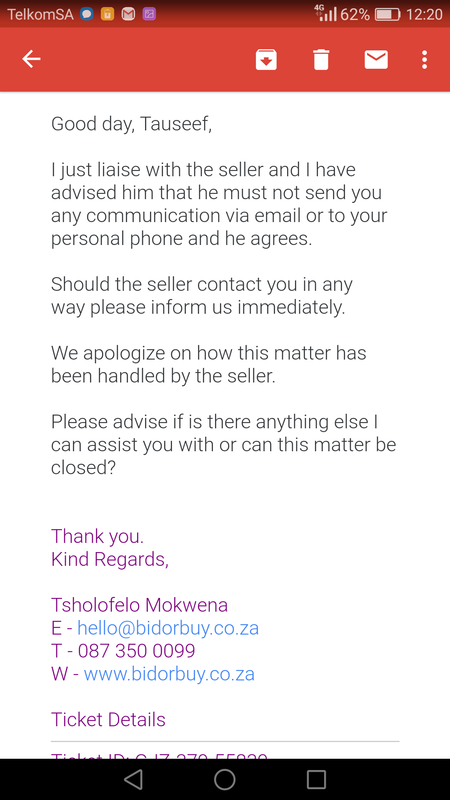 They contacted the seller and threaten to close the seller's acount with them if the matter was not resolved. The seller then offered to replace the item. I accepted. The following day the seller retracted this decision and offered to refund me. This has resulted in a lot of emails going back and forth. 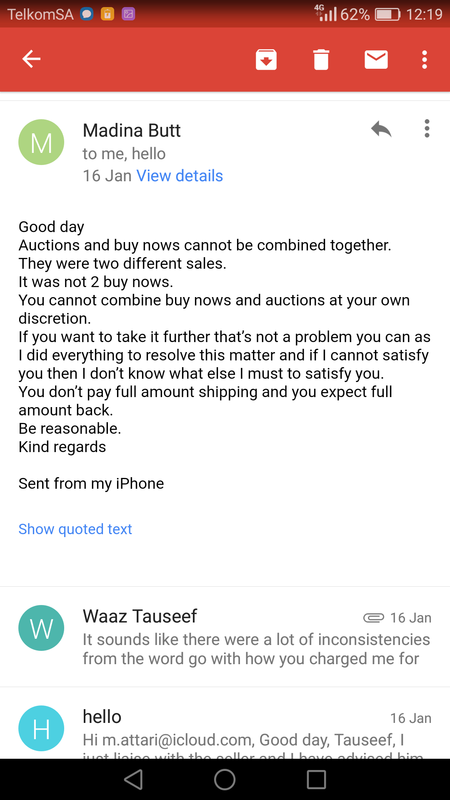 The seller's representative pulled me into a whatsapp chat without my permission. The seller also called me without BOB's knowledge, but I refused to answer the call, as BOB was acting as a mediator between myself and the seller. So the attempts from the seller to contact me privately is what I call harrassment. I reported the Whatapp and calls to BOB whereby they instructed the seller to refrain from contacting me privately. They stopped contacting me. I received a refund, but forfeited the shipping cost. The seller explained to BOB that 2 items were delivered, and there is no way I can receive a full shipping refund on the 1 item that were faulty. I explained to BOB that I had no interest in a refund. All I wanted was for the item to be replaced. Well, the seller was unhappy about the fact that BOB gave them an altimatum to either resolve the matter with me (the buyer) or their account would be closed. 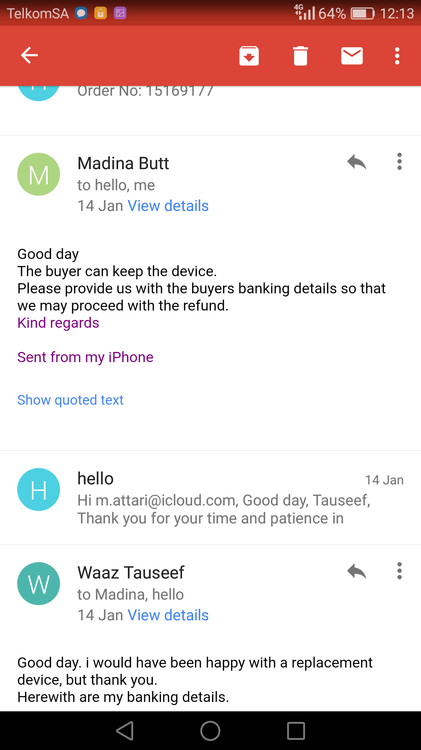 Ater I decided to now also let go the shipping refund issue, I consulted with BOB about posting a nagative review about the seller. They informed me that it was my right if I felt that I had a bad experience with a seller. 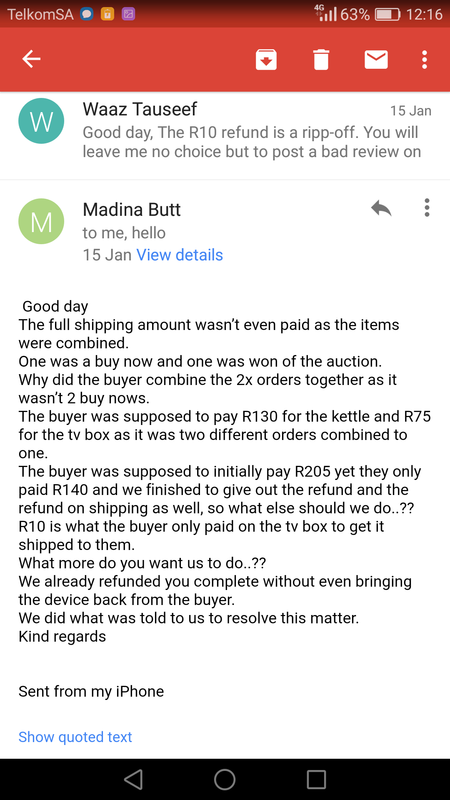 BOB also informed me that there were previous complaints from other buyers regarding the same item purchased that did either not work..or were faulty. "All salers on bob this person gives unnecessary negative ratings worst buyer on bid or buy"
Please be aware of DEALS GALORE. 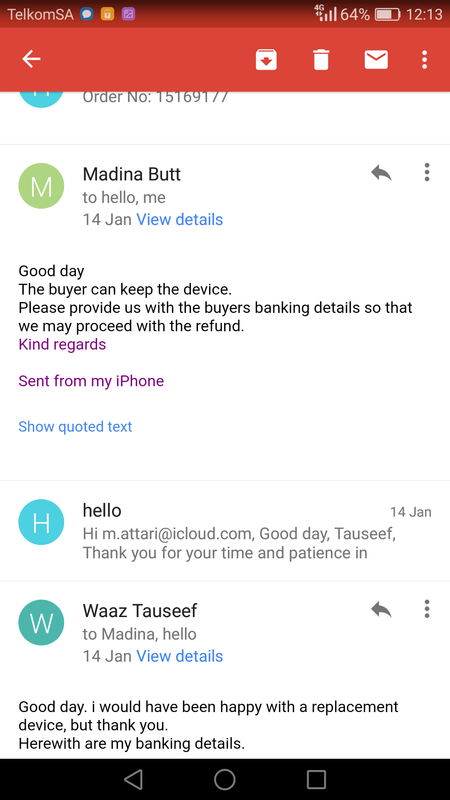 I am sure that they could have done more to resolve this matter without having to refund me. Refund should be the last resort. It is the principle of how the matter was handled. It would seem that the saying that THE CUSTOMER COMES FIRST has little or no meaning to DEALS GALORE. To me it was never about wanting a refund, but rather to provide the customer service that I deserved. By that I mean they could have sent me a replacement item, and returned the faulty item to their supplier without allowing this to become a bad taste in my mouth. BOB has done their utmost to resolve the issue and I will continue to make purchases through BOB. I just wont he buying from DEALS GALORE, no matter how tempting their prices are. I would rather choose a different seller whp puts its customers first. 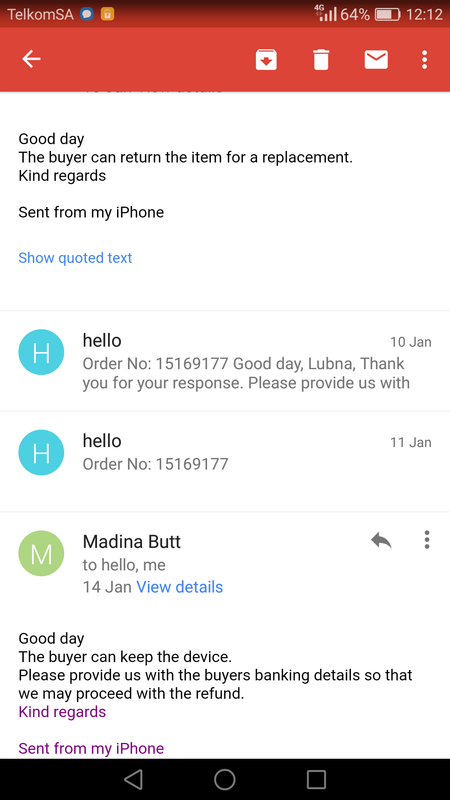 I am really glad if you have received good service from DEALS GALORE as that was my expectation too. I do a lot of online purchasing from other international online shops such as Allie Express and Chinamart.